-- Esk, River -- "Esk flu"
-- Lyne, River -- "Leven flu:"
-- Medohush Wood (?) 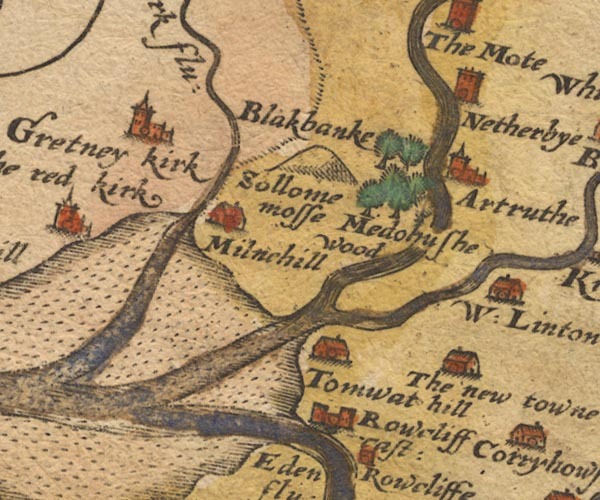 -- "Medohushe wood"
-- Mill Hill -- "Milnehill"
-- Newtown of Rockcliffe -- "The new towne"
-- Rockcliffe Castle (?) -- "Rowcliff cast:"
-- Sark, River -- "Sark flu:"
-- Solway Moss -- "Sollome moss"